Well, the Ghost blog didn’t really work out for me. I just can’t justify paying for a service that I can do myself. So I’ve moved my blog again, now using a blogging platform built on top of Laravel 4 called Wardrobe. This way if there’s anything wrong with it, I easily be able to fix it myself. So continuing the tradition of my first blog post reviewing the system I’m using, here are my thoughts on Wardrobe. The Wardrobe admin interface is very simple. It’s still in it’s infancy, but I can really see a lot of potential to the system. Blogging platforms are generally heavy beasts (looking at you WordPress), but with the recent trend of simple blogging interfaces, it’s definitely on the right track. 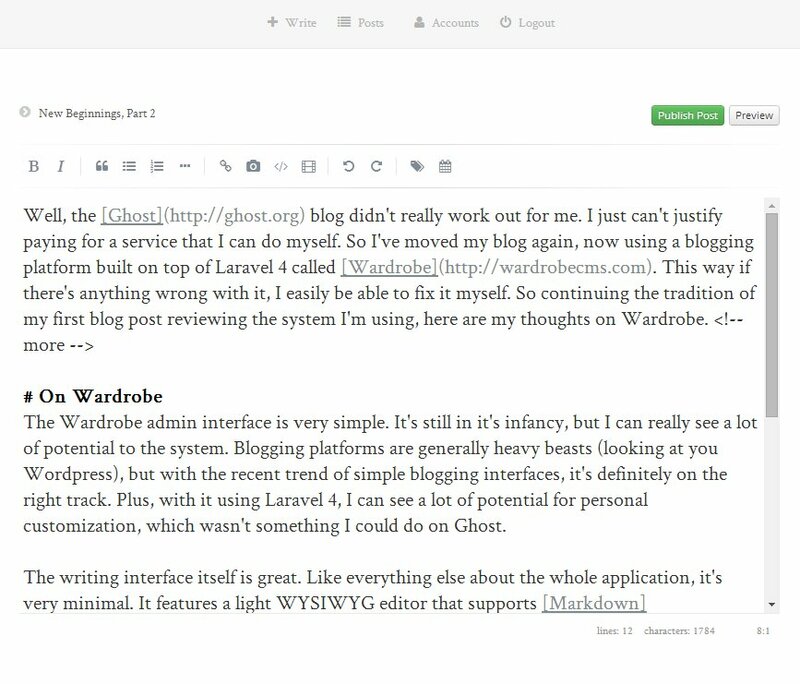 Plus, with it using Laravel 4, I can see a lot of potential for personal customization, which wasn’t something I could do on Ghost. The writing interface itself is great. Like everything else about the whole application, it’s very minimal. It features a light WYSIWYG editor that supports Markdown and a few tools to help with stuff like image uploads, Youtube video embeds and the like. One big plus for me is the drag-and-drop functionality, which makes it insanely easy for me to attach images and file. Personally, I like using Markdown since it provides a clean-cut API for generating almost any type of markup you’ll need in a blogging environment, and with the drag-and-drop functionality, it sealed the deal as my next choice for my blogging platform. The blog administration though is not something I care for a lot. This would be something that I’d rather be a little more complicated than simple, i.e., it should let me be able to manage my content easier. On the bright side, this would be something I can add in myself in the future, if I have time to work on it. All in all, I think it’s a great, minimal blogging framework, and I hope the makers continue to support it through it’s infancy. Posted on May 23, 2014 April 1, 2015 by nikkobautista	This entry was posted in Meta and tagged blog, wordpress. Bookmark the permalink.